The most interesting birds were all long-stayers, with the Scaup, a Garganey, a Quail and a Short-eared Owl all seen during the day. A Common Sandpiper was in Nouster Bay, 5 Siskins were dotted round the island, and other small migrants included 3 Collared Doves, 1 Blackcap, 2 Chiffchaffs, 1 Willow Warbler and 3 Spotted Flycatchers. 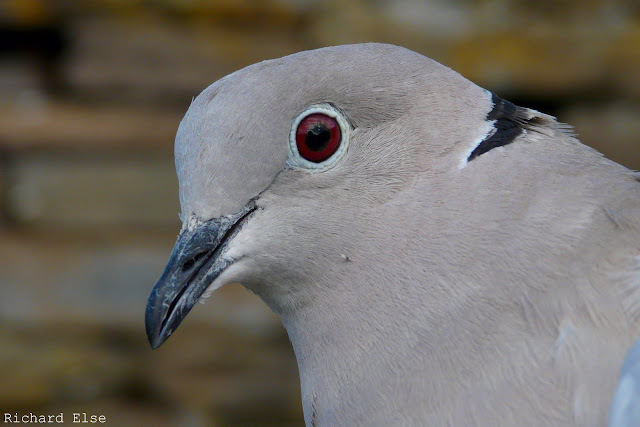 Several Collared Doves have been ringed in Holland House garden this year, including this female trapped this morning. New birds were thin on the ground during the morning census counts: a Grey Plover, a Spotted Flycatcher, a Greenfinch, a Siskin and a Crossbill were the only notable arrivals. The Scaup, Turtle Dove, Cuckoo, Icterine Warbler and Wood Warbler were all still present. A northbound movement of 240 Turnstones was noted in the afternoon, while other waders on the island included 8 Whimbrels and 2 Black-tailed Godwits. A late night cycle around the island listening out for Corncrakes and Quails revealed none of the former, 1 of the latter and a bonus Short-eared Owl. Two Quails singing near Gravity and a Wood Sandpiper on Gretchen Loch were the most interesting new birds, and a good selection of other scarce species was seen. Notable long-stayers included an Icterine Warbler, the Rosefinch, the Scaup, the Turtle Dove the Wood Warbler and the Snow Goose type thing. A Pied Flycatcher, 3 Common Whitethroats and a Collared Dove were probably new arrivals, while a Spotted Flycatcher, 2 Chiffchaffs, a Willow Warbler, and a Cuckoo remained from earlier days. A Barnacle Goose flew over the island, 16 Pink-footed Geese were seen and 8 Manx Shearwaters passed by the seawatching hide. After a period of several days in which no birds of prey were seen at all, a raptorial trio of Marsh Harrier (the fourth one this year, and a female this time), Peregrine and Sparrowhawk provided the highlights of a fairly quiet day. There was still some quality remaining from earlier days' arrivals: the Turtle Dove was in Holland garden, the Icterine Warbler was still at the observatory, the Scaup was still on Gretchen Loch, two Garganeys were near Bridesness and a Cuckoo was on the west coast. 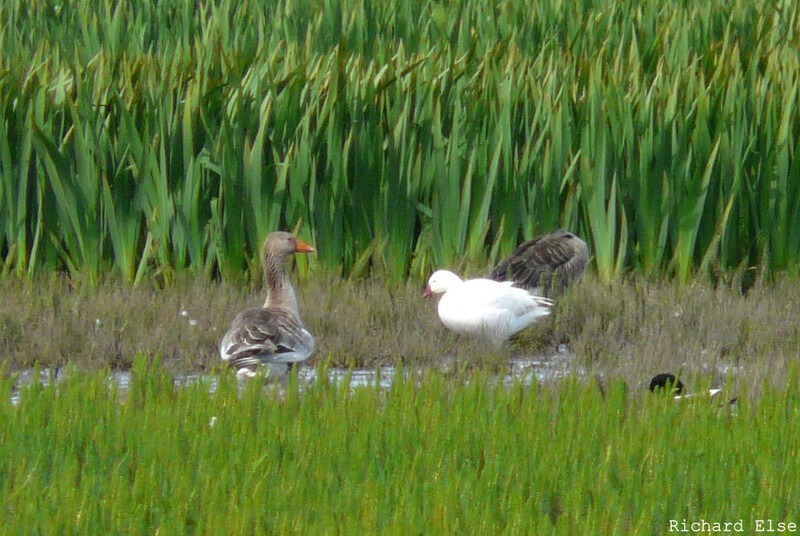 The strange Snow Goose was also still present near Hooking Loch. Other sightings included the 17 Pink-footed Geese, a Cuckoo, a Blackcap, a Chiffchaff, a Willow Warbler and a Spotted Flycatcher. 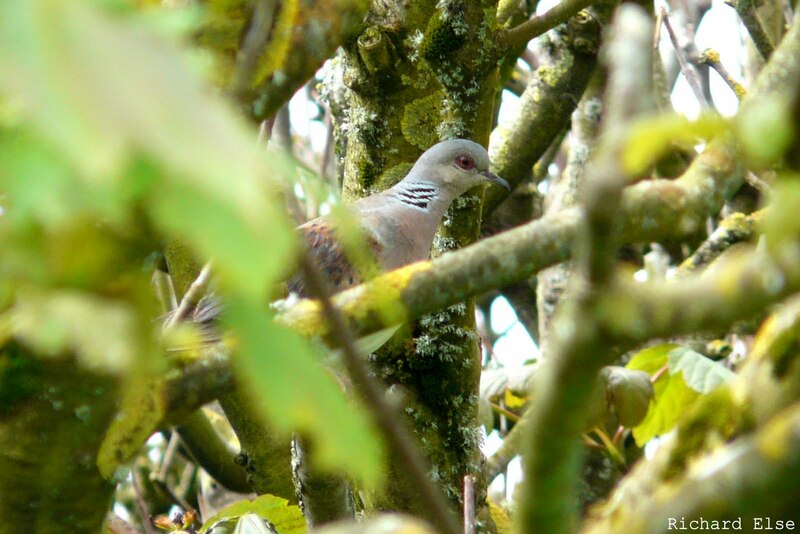 The Turtle Dove seems to be settled in the sycamores at Holland, where it has been making good use of the new bird table. 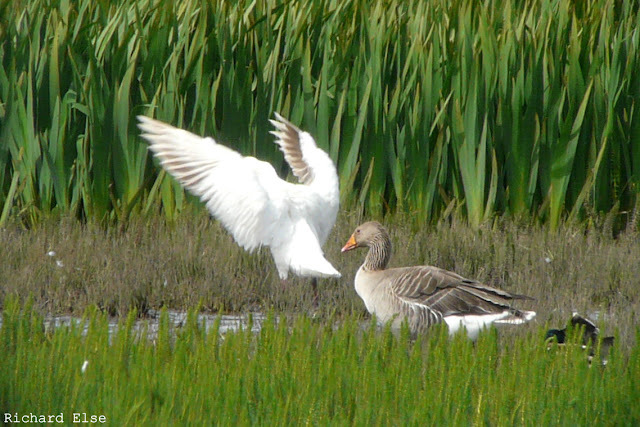 The day's main excitement arrived in the form of a Snow Goose that flew in and landed on Ancum Loch early in the afternoon. We can but speculate as to the bird's origins, but its heavily bleached and abraded primary feathers, possibly the result of a missed moult, do not help the case for it being a wild bird. 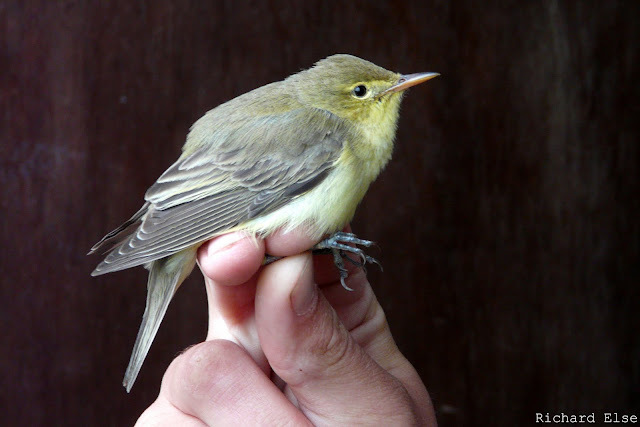 The Icterine Warbler remained in the surgery garden, and another was discovered near the observatory and trapped in the evening. The Rosefinch was also still present, and it, or another bird, was seen in several places during the afternoon. A Wood Warbler was at Holland House, and a Corncrake was reported singing near Hooking Loch. Other recent scarcities continued to linger on the island: the Turtle Dove remained at Holland, 2 Garganeys were seen, and the Red-necked Phalarope and Curlew Sandpiper were both still at Trollavatn. The first Icterine Warbler of the year was found in the garden at the surgery, and a 1st summer male Common Rosefinch was singing nearby. 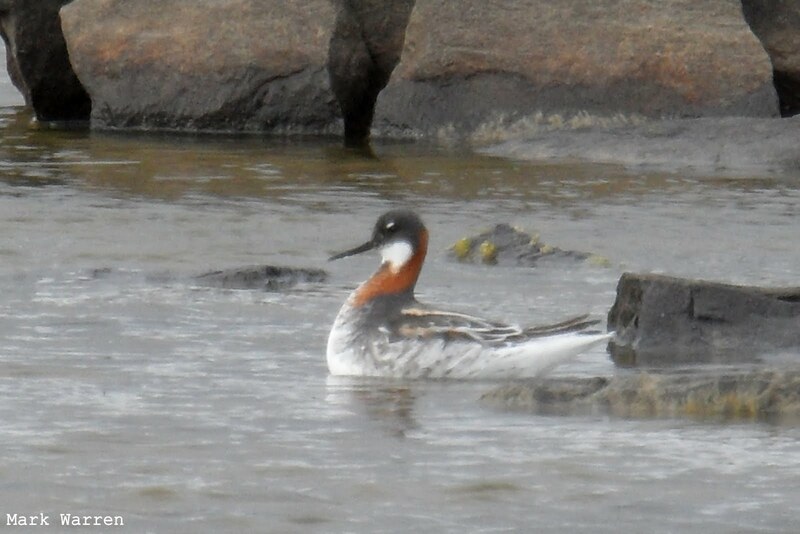 The Red-necked Phalarope and Curlew Sandpiper reappeared on Trollavatn, the Scaup was still on Gretchen Loch and the Turtle Dove was at Holland House. A small arrival of migrant landbirds included 2 Tree Pipits, a Common Redstart, a Fieldfare, a Common Whitethroat, a Blackcap, 4 Chiffchaffs, 3 Willow Warblers, 3 Spotted Flycatchers and a Pied Flycatcher. The flock of 17 Pink-footed Geese remained, 6 Manx Shearwaters were seen offshore and notable wader counts included 50 Knots and 360 Ringed Plovers: the latter count is the second highest ever recorded on North Ronaldsay. The Scaup was still present, a Blackcap was in Holland garden and a Common Redpoll was seen. That's about it. We have recently been informed of the history of the White-tailed Eagle that visited North Ronaldsay on the 24th and 25th of April. Known affectionately as C945, it was ringed last year as a five week old eaglet in its nest at Lochalsh near the isle of Skye, and biometrics suggested that it is a female. She was the first known White-tailed Eagle to fledge from this site since the eagle project began there. This information, and the image below of C945 in the nest, were kindly provided by Stephen Bentall of the RSPB. More information on White-tailed Eagles in Scotland can be found on the RSPB website: http://www.rspb.org.uk/. In terms of the weather, it was like February all over again: westerly gales, driving rain and poor visibility combined to make all outdoor activities an unpleasant experience. An afternoon in the seawatching hide failed to produce any of the hoped-for Long-tailed Skuas, and the phalarope appeared to have departed. The only notable new arrival of the day was a Turtle Dove in Holland House garden, which was a nice surprise; the only lingering birds of interest were the Scaup and the Little Stint. A day dominated by utterly foul weather was not predicted to provide particularly fruitful birding, but it managed to surpass expectations and a few good scarcities were discovered. The highlight was undoubtedly a female Red-necked Phalarope that spent the day on Trollavatn, feeding on insects in the company of a Curlew Sandpiper and a Little Stint. 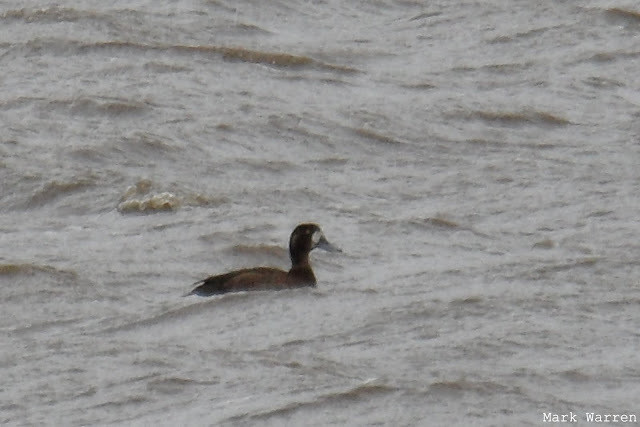 Also very scarce on the island, and a new species for the year, was a female Scaup on Gretchen Loch. 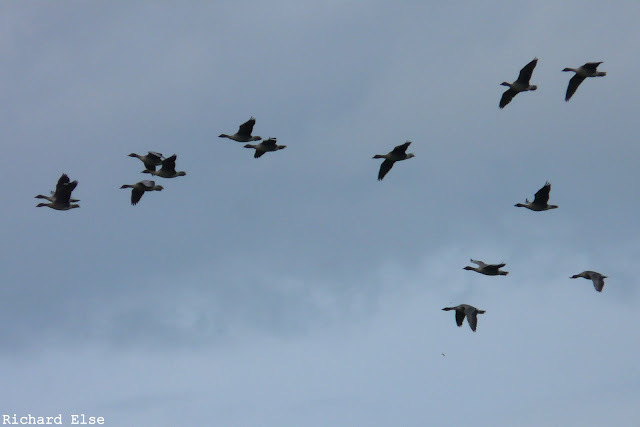 Other wildfowl sightings included 2 drake Garganeys, a late Red-breasted Merganser and the lingering group of 16 Pink-footed Geese and 2 Barnacle Geese. The Short-eared Owl was still present, and a scanty selection of small landbirds included a White Wagtail, a Common Whitethroat, a Blackcap, a Chiffchaff and a Lesser Redpoll. 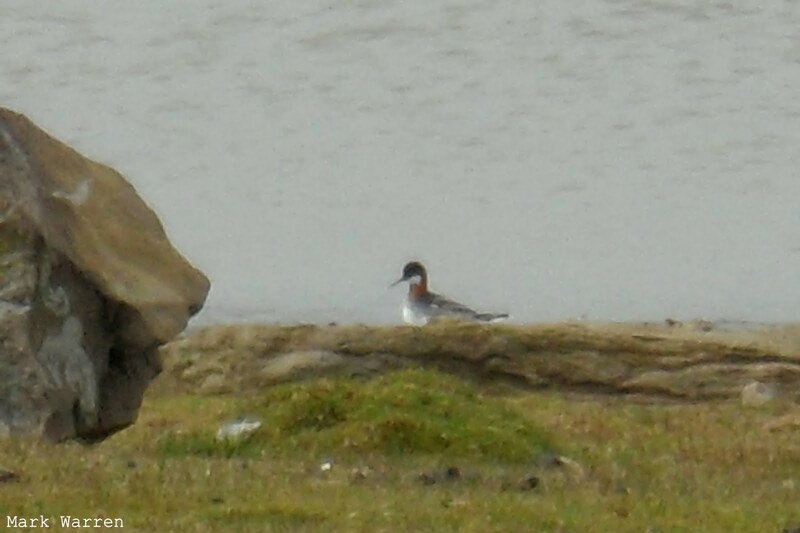 The Red-necked Phalarope gave good views, but was uncharacteristically skittish and not approachable enough for close-range photographs to be taken. Though still rather a poor showing for the time of year, there were a handful of notable sightings. The first Short-eared Owl of the year was present, apparently for its second day, and a pair of Garganeys were on Garso Loch. 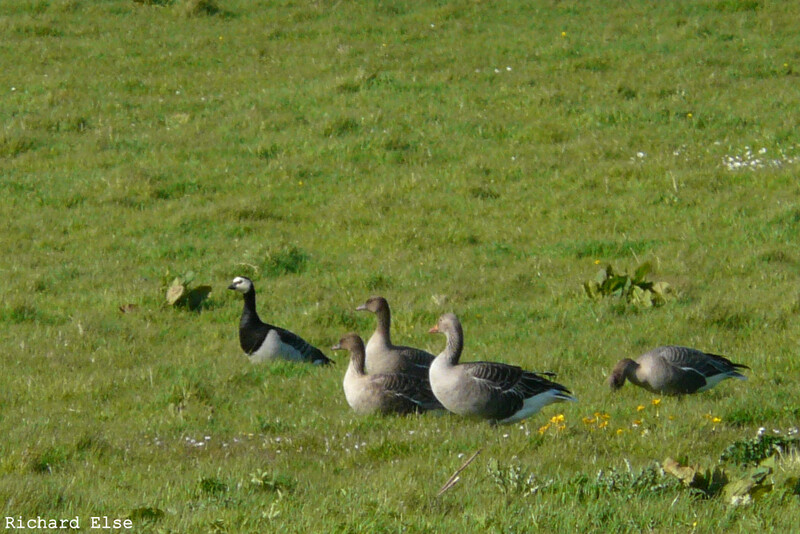 A third Barnacle Goose joined the previous day's duo, and spent the day in the company of the 16 Pink-footed Geese. 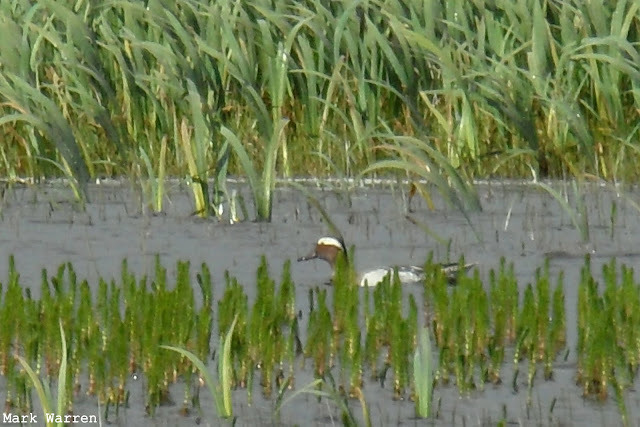 A Long-tailed Duck was unexpected: a full month had passed since the last sighting of this species. A Cuckoo was the best of the regular landbirds, while other sightings included a Kestrel, 9 Collared Doves, a Common Whitethroat, a Blackcap, a Chiffchaff and a Willow Warbler. There was no improvement in the number of passerines present, but another Quail was discovered near the post office. 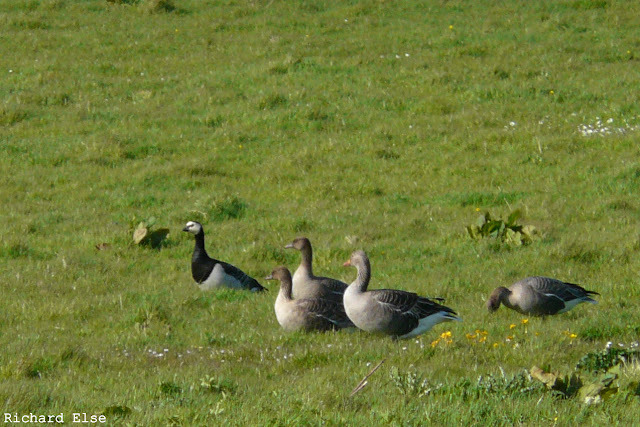 Two drake Garganeys were lurking on Hooking Loch, presumably having been hiding in the irises there for some days, and a second Barnacle Goose had joined the previous day's bird. A male Kestrel was newly arrived, a Woodpigeon was still around and the flock of Collared Doves in Holland gardens increased to 8. A Common Sandpiper and 3 Bar-tailed Godwits were the most notable waders. Still the wind sat stubbornly in the west, and still it prevented any small migrants from reaching North Ronaldsay; but, happily, there were at least a few interesting non-passerines to keep the spirits up. A Barnacle Goose was a long-awaited addition to the island year-list; the third Marsh Harrier of the year, an immature male, was seen near the lighthouse; a Curlew Sandpiper was the best of a good selection of waders; and a 2nd-summer Little Gull was at Quoy Banks. Impressive numbers of waders remained on the island, with 95 Knots, 101 Dunlins, 1 Black-tailed Godwit, 1 Bar-tailed Godwit, 1 Greenshank and 1 Common Sandpiper amongst the hundreds of Turnstones and Sanderlings. 16 Pink-footed Geese and the aforementioned Barnacle Goose were mingling with the breeding flock of Greylags, which now includes several crèches of goslings, at Hooking Loch. Landbirds were in short supply: 2 Blackcaps, 1 Woodpigeon, 5 Collared Doves and the remaining pair of Jackdaws were the most noteworthy. Another day of westerlies almost managed to be completely devoid of anything that could sincerely be called a highlight, but Little Stints at Westness and the golf course just about saved the day, although both could easily be the same birds that were seen earlier in the week. A Sparrowhawk, 3 Collared Doves and the same 2 Jackdaws were the only other sightings worth mentioning. The persistent, strong westerly airflow proved predictably unpropitious as a vector of avian migration, and the departure of the lingering semi-scarcities left us virtually bereft of anything worth reporting. A couple of Jackdaws in the morning transpired to be just about the only new passerines recorded all day, while a Cuckoo was the pick of the non-anisodactyl species. A Manx Shearwater flew past the seawatching hide, and 17 Pink-footed Geese dropped in near the lighthouse. 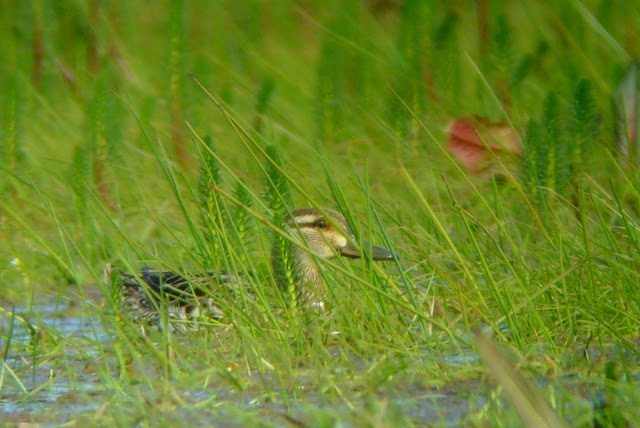 Several notable species were recorded, although most of them were birds that had arrived earlier in the week: the 3 Crossbills were still present, the Little Stint remained at Westness, a Wood Sandpiper flew over the observatory, a drake Garganey was seen near the post office and a Turtle Dove was at Ancum. Small migrants included 2 Common Whitethroats, 5 Blackcaps, 1 Willow Warbler, 1 Brambling and 1 Common Redpoll. A Woodpigeon and 3 Collared Doves were seen, and an afternoon corvid movement involved 8 Rooks, 4 Carrion Crows and 1 Carrion x Hooded Crow hybrid. 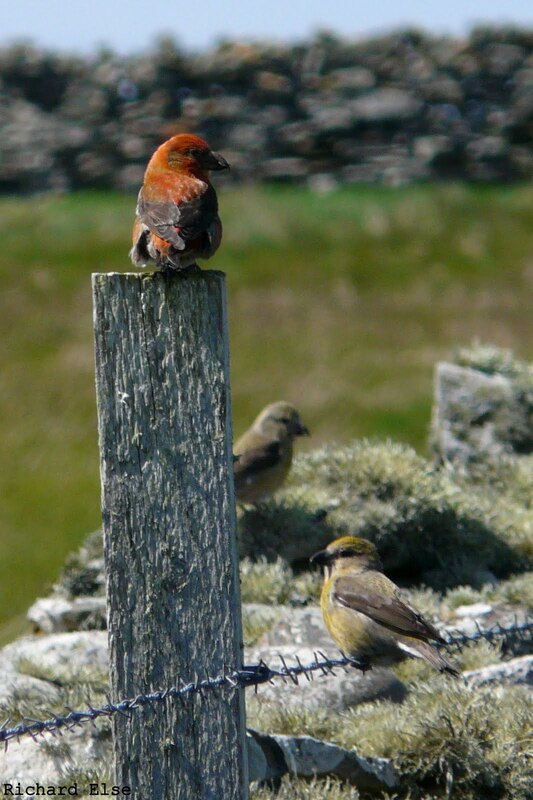 The Crossbills at the surgery and Nether Linnay obligingly teamed up for a group photo. 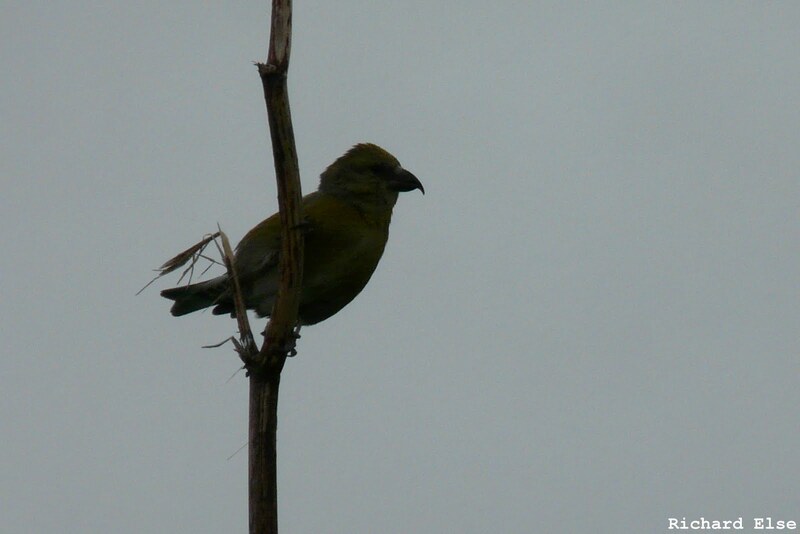 Three Common Crossbills (2 at the surgery and 1 at Nether Linnay) were a pleasant surprise in an otherwise fairly uneventful day. 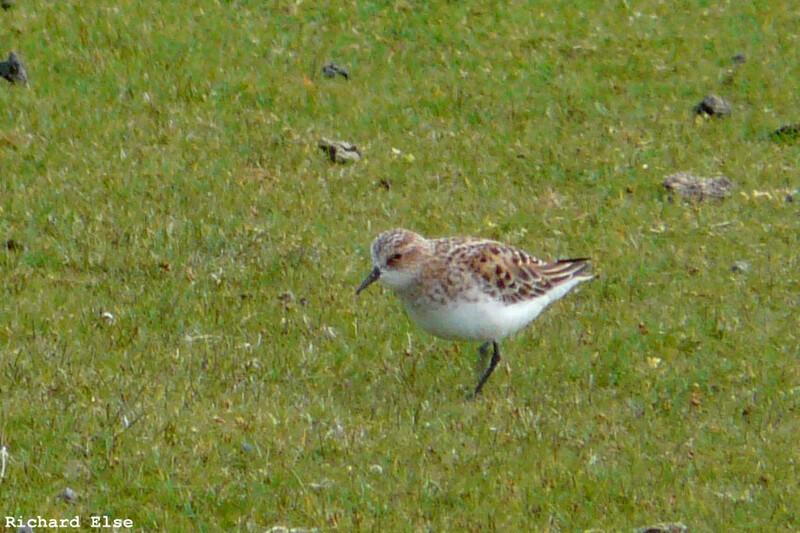 A Little Stint was on the beach at Westness and 3 Garganeys were seen: a drake on Brides Loch and a pair on Gretchen Loch. Just how many Garganeys have visited the island in the last couple of weeks is anybody's guess. With not a pine cone in sight, dandelions seem to make an adequate substitute meal for a hungry, camera-shy Crossbill. Hardly any new birds were seen during a very quiet day. A Tree Pipit and 2 Siskins were the only new arrivals worth mentioning; a Garganey, a Wood Sandpiper and the Little Stint were all notable species lingering from earlier days; and two Blackcaps, a Willow Warbler and a Chiffchaff remained at Holland. 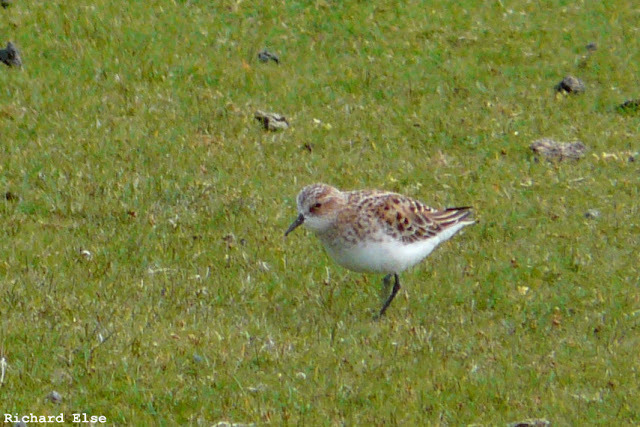 The Little Stint spent the morning with the Sanderlings on the golf course. 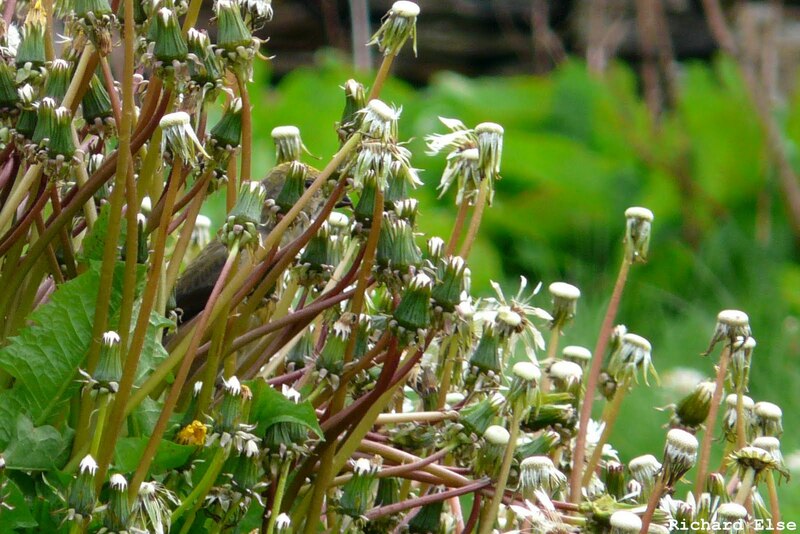 With the wind firmly settled in the west, the chances of much passerine migration reaching North Ronaldsay were slim, but the first Reed Warbler of the year still managed to find its way to the Holland House garden. Wader passage, not so strongly dictated by aeolian orientation, continued apace: Curlew Sandpiper and Little Stint both made their débuts in the year's log, and good numbers of the regular species were recorded. The second Cuckoo of the year was seen, and four Garganeys were still present. Other sightings included a Common Redstart, 6 Sedge Warblers, a Common Whitethroat, 2 Garden Warblers, 4 Blackcaps, 3 Chiffchaffs, 4 Willow Warblers, a Common Redpoll, a Sand Martin and 8 House Martins. A Manx Shearwater passed by at sea and a Merlin and a Sparrowhawk were the only raptors. Perhaps the best sighting of the day was the first Otter of the year, seen at the north end of the island by visitors to the observatory. A Turtle Dove at Ancum was the best new bird of the day, while 3 Garganeys and a Wood Sandpiper remained. Small migrants were few and far between: a Sand Martin, 5 House Martins, 2 Tree Pipits, 3 Sedge Warblers, 1 Whitethroat, 1 Garden Warbler, 3 Blackcaps, 1 Chiffchaff, 1 Willow Warbler and 1 Lesser Redpoll were the only ones worth mentioning. A Common Sandpiper and 2 Collared Doves were also present. 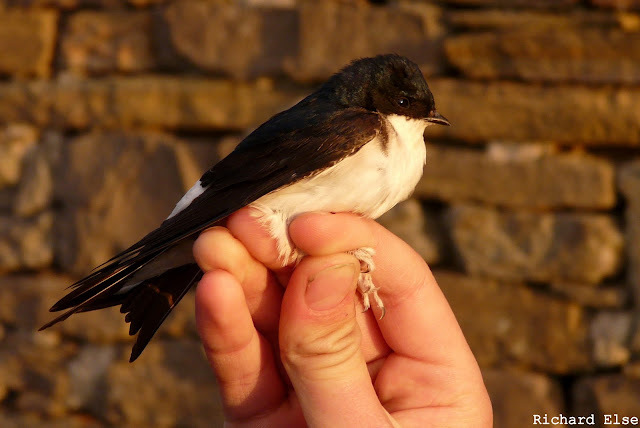 House Martin is not a species that features regularly on the NRBO ringing schedules, so one caught at Holland House in the evening provided an uncommon opportunity to admire its hairy little feet and sharp claws up close. Another enjoyable day of varied birding delivered a further scattering of minor scarcities among the more routine migrants. The first Wryneck of the year spent the day at Holland House giving good views at times, but somehow evading capture in the mist nets. 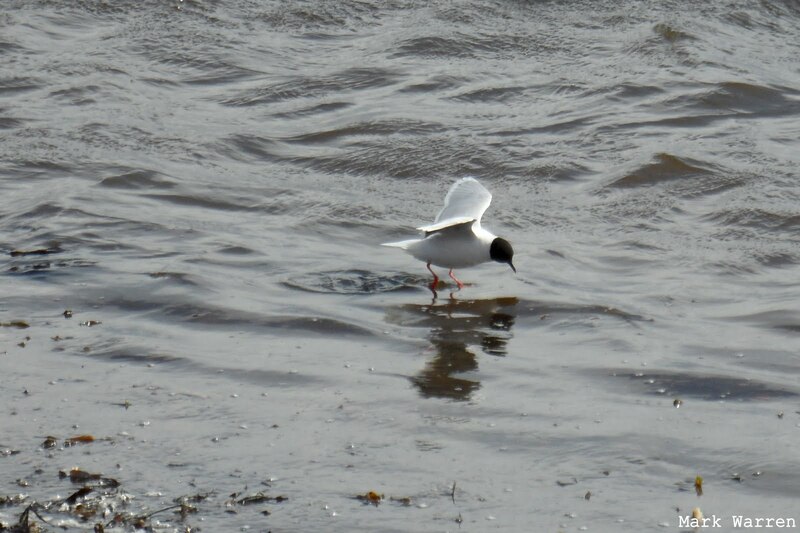 A Wood Warbler and a Goldfinch were also at Holland, while the highlights from the north of the island were a male flavissima Yellow Wagtail and a Black Redstart at the lighthouse, an adult Little Gull on Bewan Loch and 2 flyover Wood Sandpipers. Wader numbers continued to build up, with notable counts including 622 Sanderlings, 232 Ringed Plovers, 42 Knots and 33 Dunlins. Common summer migrants included 3 Sedge Warblers, 1 Lesser Whitethroat, 1 Common Whitethroat, 4 Garden Warblers, 4 Blackcaps, 1 Chiffchaff, 6 Willow Warblers, 1 Robin and 1 Common Redstart. A single Garganey remained on Hooking Loch, 2 Sparrowhawks and a Fieldfare were present, and 3 Siskins flew over the north end. Little Gulls are not usually a regular species here in spring, but today's bird was the fourth one this year. 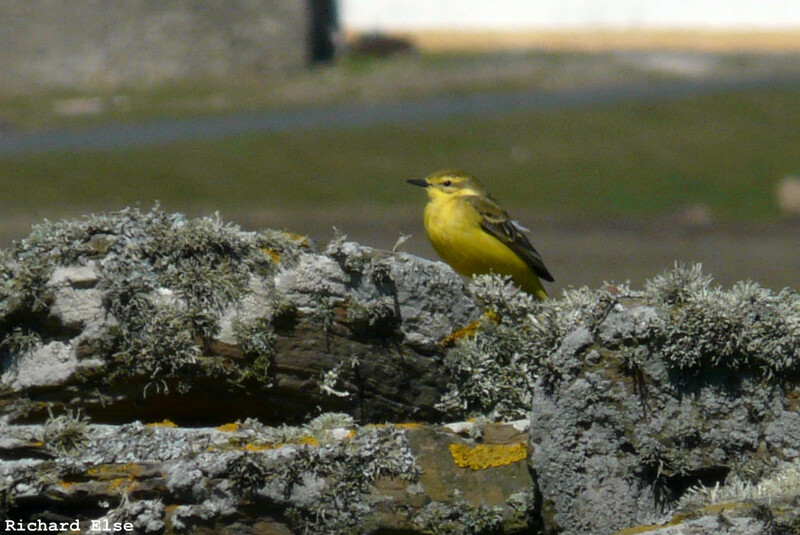 The majority of Yellow Wagtails recorded on North Ronaldsay are of either the Blue-headed flava or the Grey-headed thunbergi subspecies, so it was nice to see a proper British Yellow Wagtail feeding with the local Pied Wagtails at the lighthouse. The first Cuckoo of 2011 made a good start to the day, and a good list of species was recorded during the rest of the morning. Particularly surprising was the reappearance of the female Eastern Subalpine Warbler at Holland, having somehow contrived to evade detection amongst the dense thickets for six days. A Long-eared Owl was also still roosting at Holland, and 4 Garganeys were present on the island. The (or a different) Lesser Redpoll was in the surgery garden, along with a Common Redpoll. Counts of small summer migrants came to 4 Sand Martins, 3 House Martins, 1 Tree Pipit, 1 White Wagtail, 2 Whinchats, 52 Wheatears, 8 Sedge Warblers, 10 Lesser Whitethroats, 1 Common Whitethroat, 2 Garden Warblers, 5 Blackcaps, 5 Chiffchaffs and 11 Willow Warblers. Other sightings included a Fieldfare, a Siskin, 2 Woodpigeons, 3 Collared Doves, 2 Sparrowhawks, 14 Whimbrels and 2 Common Sandpipers. A bit of corvid movement was evident, comprising 7 southbound Ravens, 1 Rook, 5 Carrion Crows and 3 biracial Hooded x Carrion Crow hybrids. The continuing spring growth of the island's copious aquatic vegetation is making it increasingly difficult to find waterbirds, such as these Garganeys, on the lochs and ponds. The highlights of a quieter day were 5 Garganeys (a pair on Brides Loch, 2 drakes and a duck on Hooking Loch) and a Quail at Stennabreck. A Lesser Redpoll was the most notable small migrant, although other passerines included a House Martin, a Tree Pipit, a White Wagtail, a Robin, 3 Fieldfares, 9 Sedge Warblers, 6 Lesser Whitethroats, 1 Common Whitethroat, 2 Garden Warblers, 4 Blackcaps, 5 Chiffchaffs, 6 Willow Warblers, a Spotted Flycatcher and a Chaffinch. 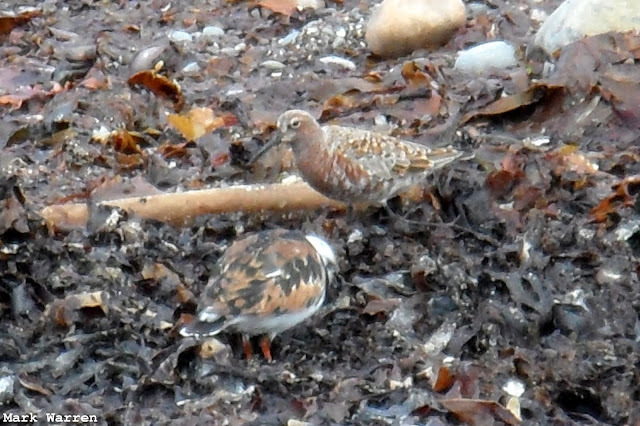 A Wood Sandpiper was still on Hooking Loch, and 2 Woodpigeons and 5 Collared Doves were seen. A pair of Garganeys were on Brides Loch, and three were seen on Hooking Loch a short time later. 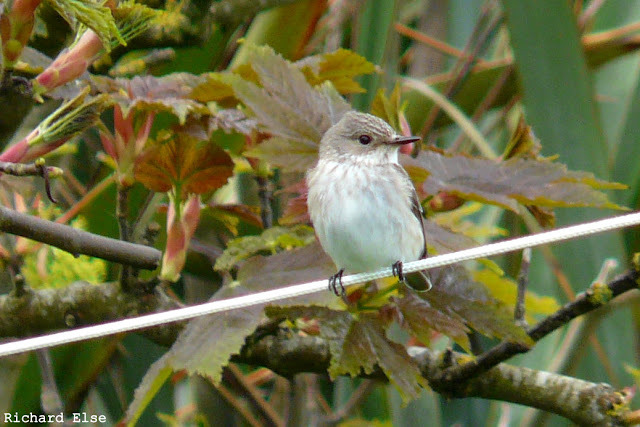 The Spotted Flycatcher was still in the garden at Holland. The south-easterly wind persisted, in bright sunshine this time, and an excellent set of species was recorded during another varied day's birding. 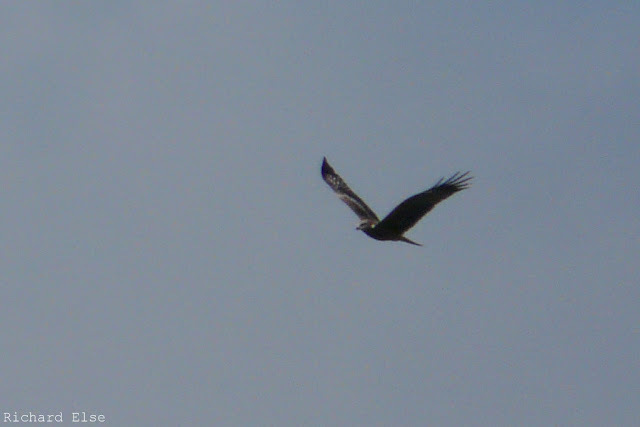 A first-summer Marsh Harrier spent much of the morning hunting around the island's lochs, and an Osprey passed overhead on its way northwards early in the afternoon. 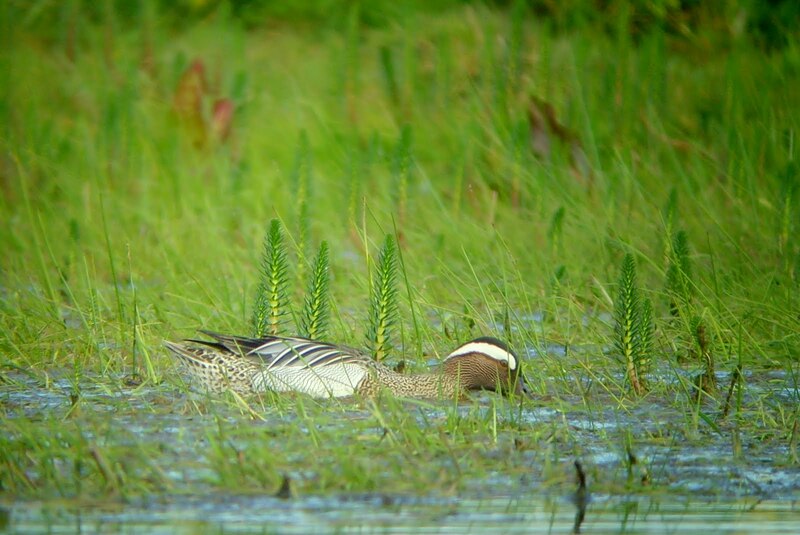 A drake Garganey and a Wood Sandpiper were on Hooking Loch, along with a bizarre female hybrid duck that, on preliminary investigations, appears to be a Mallard x Wood Duck cross! A flock of gulls at the north end of the island contained a first-summer Iceland Gull among the commoner species. Numbers of waders continued to build up. The Sanderling count reached 333 birds, while a total of 1041 Turnstones is the highest ever count of the species here. The 2 Dotterels were still on Tor Ness and 15 Whimbrels and a Common Sandpiper were around the coast. A good selection of passerines was again present, with migrant species including 14 Lesser Whitethroats, 6 Common Whitethroats, 4 Garden Warblers, 5 Blackcaps, 7 Sedge Warblers, 7 Chiffchaffs, 18 Willow Warblers, 2 Spotted Flycatchers, 8 Tree Pipits, 1 Common Redstart, 1 Whinchat, 2 Robins, 1 Dunnock, 1 White Wagtail, 2 Ring Ouzels, 4 Fieldfares and 13 Carrion Crows. There was plenty of hirundine movement too, with a Sand Martin and 3 House Martins noted with at least 158 Swallows. Non-passerines included a Long-eared Owl still at Holland, 2 Sparrowhawks, 2 Kestrels, 2 Woodpigeons and a Collared Dove. And finally, on a non-avian note, a conspicuous arrival of Red Admirals took place, with 87 counted around the island. Strong south-easterly winds and rain for much of the day deposited a good number of migrants on the island and produced one of the best days of the year so far. A male Bluethroat near Kirbest was the highlight, and the first 2 Garden Warblers and 3 Spotted Flycatchers of the year also arrived. 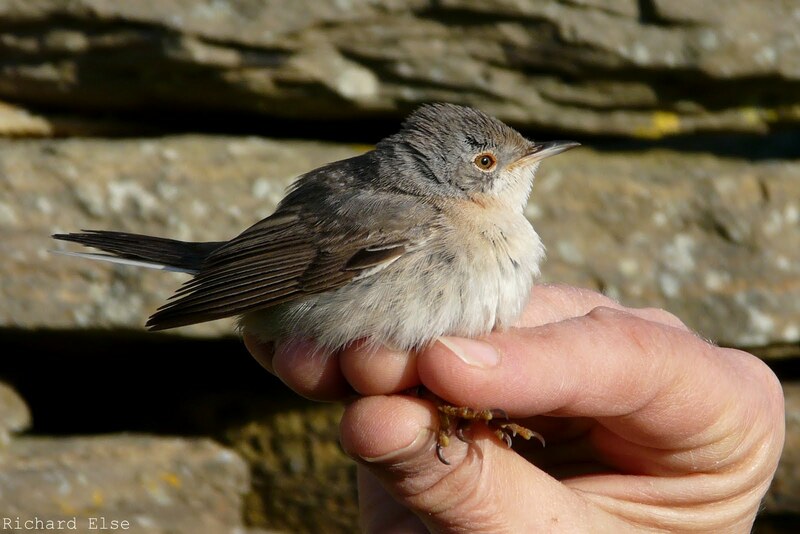 Most small migrants were concentrated around the north and west of the island, and included at least 18 Lesser Whitethroats, a Redstart and 2 Whinchats along with 9 Chiffchaffs, 9 Willow Warblers, 6 Blackcaps, 4 Sedge Warblers, 4 Whitethroats. A White Wagtail, 2 House Martins, a Dunnock, 2 Robins, 58 Wheatears, a Ring Ouzel, a Fieldfare and a Song Thrush were also counted. A couple of Dotterels were found on Tor Ness in the afternoon, while other waders included 4 Common Sandpipers, 10 Bar-tailed Godwits and 10 Whimbrels. A Long-eared Owl remained at Holland House, and 6 Collared Doves and a Woodpigeon were also present. 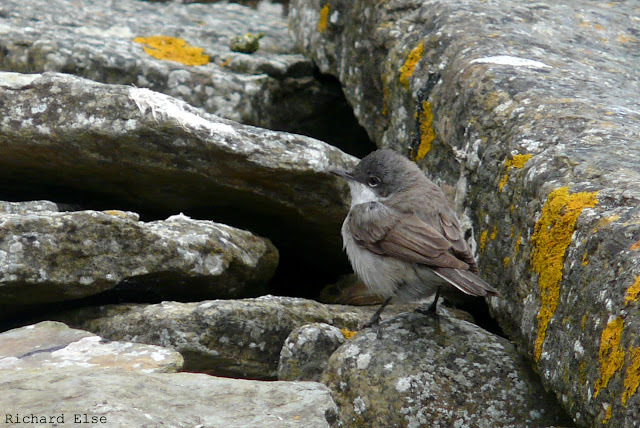 Most of the Lesser Whitethroats were to be found among the rocks and boulders on the west coast. A couple of Long-eared Owls spent the day in the gardens at Holland, and a Turtle Dove was also seen there briefly in the morning. The day's other highlight was a male Marsh Harrier flying south over the island. Numbers of common passerine migrants were similar to the previous few days: 5 Sand Martins, 2 House Martins, a littoralis Rock Pipit, a Dunnock, 2 Robins, 1 White Wagtail, 66 Wheatears, 1 Ring Ouzel, 2 Fieldfares, 2 Lesser Whitethroats, 1 Common Whitethroat, 3 Blackcaps, 4 Chiffchaffs, 4 Willow Warblers and a Common Redpoll were counted. The flock of Knots increased to at least 61 birds, 5 Collared Doves and a Woodpigeon were present, and a Sparrowhawk and a Merlin were the only common raptors. A wet morning seemed to bring a variety of birds down, and there were a few good sightings before the end of the day. The highlight was a drake Green-winged Teal that showed well at the far end of Gretchen Loch during the afternoon. A Quail flushed near Westness was the earliest ever record here. The most notable passerines were a smart littoralis Rock Pipit, a new Common Redstart, 2 Ring Ouzels and 2 Lesser Whitethroats (one new bird, one long-stayer).Counts of other small migrants came to 1 Sand Martin, 1 House Martin, 2 Dunnocks, a Robin, the same Black Redstart, 72 Wheatears, 2 Fieldfares, 2 Song Thrushes, 1 Redwing, 1 Sedge Warbler, 6 Blackcaps, 7 Chiffchaffs, and 8 Willow Warblers. The wader highlights were a Wood Sandpiper, a Greenshank, 15 Whimbrels and 45 Knots; a Common Tern and 30 Arctic Terns were counted; a Woodpigeon and 2 Collared Doves were seen, and 2 Sparrowhawks and a Merlin were the only raptors. 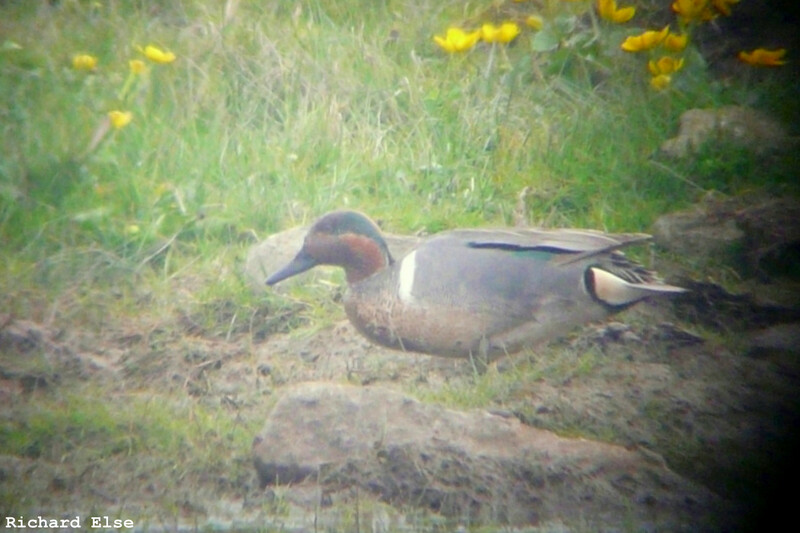 As is clear from the image, the Green-winged Teal didn't really come close enough to the hide for anything better than grainy, heavily vignetted digiscope photos to be taken. 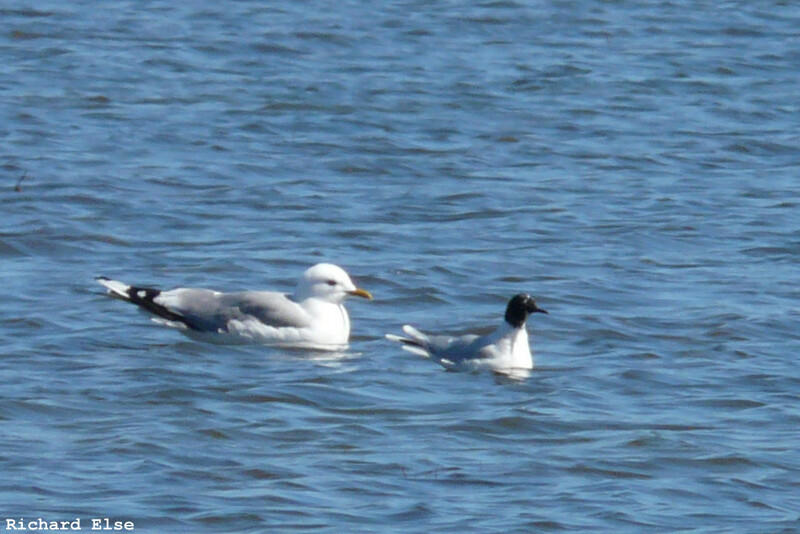 Nevertheless, the requisite features can clearly be seen, and it is interesting to compare the head pattern and shape of the white flank patch with the bird from two weeks ago. Are they one and the same? The jury is still out. The spell of glorious sunshine finally came to a breezy, drizzly end, but there was little change in the numbers of migrants grounded on the island. A male Ruff on Ancum Loch was a new species for the year, and other waders included 33 Knots, 10 Whimbrels, and 510 Turnstones (the highest count of the year so far). A Lesser Whitethroat, 2 Whitethroats, a Sedge Warbler, a Ring Ouzel, a Brambling and a Chaffinch were newly arrived, while counts of other small migrants came to 1 Dunnock, 2 Robins, the same Black Redstart, 78 Wheatears, the long-staying Eastern Subalpine Warbler, 6 Blackcaps, 2 Chiffchaffs, 1 Common Redpoll and 2 Lapland Buntings. A Sparrowhawk, a Kestrel and a Merlin were present, and 52 Swallows and a Sand Martin were seen. A small number of birds arrived in the morning, but, on the whole, it was a rather quiet day. The passerine highlights were a Wood Warbler, a Pied Flycatcher, a Common Redstart and a Ring Ouzel, while other counts came to 6 Sand Martins, 46 Swallows, 3 Robins, the same Black Redstart, 91 Wheatears, the Eastern Subalpine Warbler, 5 Blackcaps, 2 Chiffchaffs, 4 Willow Warblers and 2 Lapland Buntings. A blue morph Fulmar flew past Stromness Point, 3 Arctic Terns and 8 Whimbrels were seen, and 2 Sparrowhawks and a Peregrine were the only raptors. 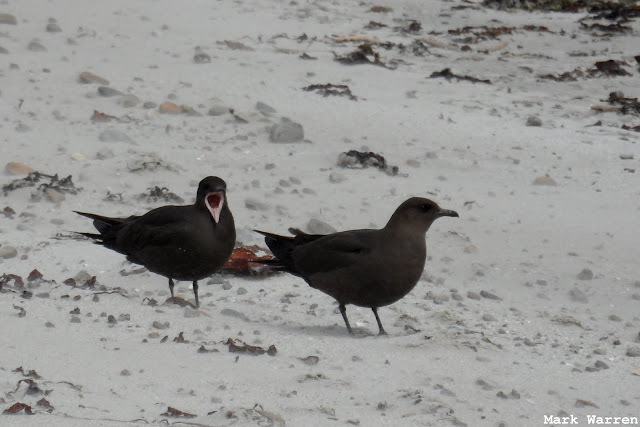 A few Arctic Skuas have been present around the island in recent days. A Wood Sandpiper and a Green Sandpiper flying over the observatory provided a good start to the day, and a Common Sandpiper later completed the trio. The belated first Arctic Tern of the year and the first Black Redstart since January were also notable new arrivals. There were a few more warblers around, including a Lesser Whitethroat, a new Sedge Warbler , a Grasshopper Warbler, 5 Blackcaps, 11 Chiffchaffs, 4 Willow Warblers and the Eastern Subalpine Warbler. The latter was heard calling several times, putting its racial identification beyond any real doubt. The Dotterel flock on Tor Ness had reduced to 3 birds, but Sanderlings, which had been growing in number for a while, increased to 203. Counts of other species came to 2 Woodpigeons, 3 Collared Doves, 1 Swift, 3 Sand Martins, a passage of 52 Swallows, yet another new Dunnock, 2 Robins, the same Common Redstart, 83 Wheatears, 1 Ring Ouzel, 2 Rooks, 9 Carrion Crows, a Common Redpoll and 2 Lapland Buntings. The Eastern Subalpine Warbler remained in Holland for its fifth day. According to the books, an important feature of Subalpine Warblers is the tail to wing ratio. In-hand examination showed that this bird had exactly one tail and two wings, giving a ratio of 0.5 – which is pretty much as expected. Continuing a good run of rare raptors on North Ronaldsay, a Black Kite flew up and down the island early in the afternoon before heading south out to sea. This is the third record of Black Kite for the island and, interestingly, turned up on exactly the same date as the one in 1997. In addition to the kite, the day's raptor count comprised 5 Sparrowhawks and a Kestrel. Notable waders included a flock of 31 Knots in Linklet Bay, 15 Whimbrels and the 6 Dotterels; a drake Common Scoter and the first Pochard for some weeks were the wildfowl highlights; and a Swift was seen again in the afternoon. A reasonable selection of passerine migrants included 4 Tree Pipits, a Grasshopper Warbler, a Sedge Warbler, 10 Blackcaps, 2 Chiffchaffs, a Willow Warbler, the female Eastern Subalpine Warbler, a Common Redpoll, a Lapland Bunting, 3 Robins, a Song Thrush, 99 Wheatears, a Dunnock and a White Wagtail. A fair variety of species were present in low numbers, and the new species for the year were a Swift (the earliest ever by ten days) and a Green Sandpiper. An extra Dotterel joined the lingering quintet on Tor Ness, 6 Whimbrels were seen and a Water Rail was heard. Passerine migrants included a Tree Pipit, 2 Whinchats, a Pied Flycatcher, 51 Wheatears, a Grasshopper Warbler, a Sedge Warbler, 6 Blackcaps, the same Wood Warbler, 6 Chiffchaffs, 4 Willow Warblers, a Carrion Crow, a Brambling, a Dunnock and 4 Robins; and 5 Lapland Buntings were still present. The Eastern Subalpine Warbler was also still in the garden at Holland. This year, several summer migrants have appeared here earlier than usual. 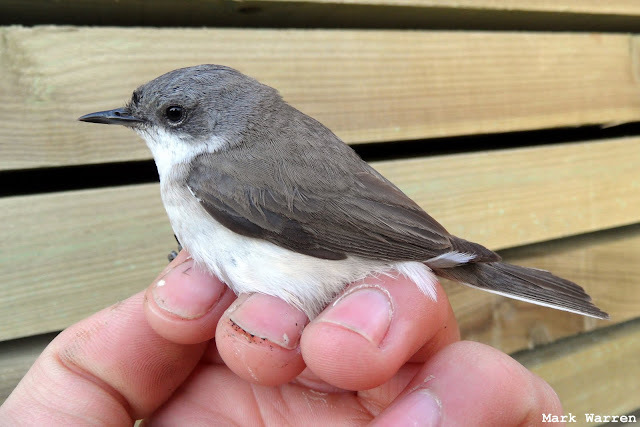 Those species setting new earliest ever arrival dates so far have been Swift, Lesser Whitethroat, Wood Warbler and Pied Flycatcher, while Dotterel and Sedge Warbler have both equalled the record. The highlights of the day were the first Wood Warbler of the year, and the earliest ever record on the island, and the first Common Redstart of the year. Two Common Scoters flew past the north end of the island; a Whinchat, a Song Thrush and a Goldfinch were found; and the Eastern Subalpine Warbler, 5 Dotterels and 9 Lapland Buntings remained. 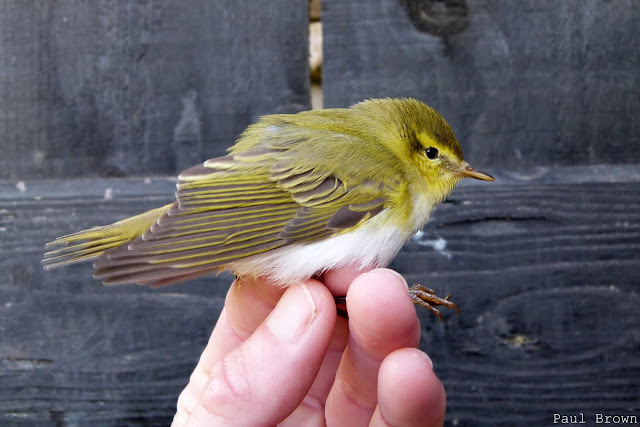 Today's Wood Warbler was the earliest ever by six days.